Heading up to the clump of trees atop Round Hill. On Sunday 10nd July, eleven of us gathered under a leaden sky in the free car park by Wittenham Clumps in Oxfordshire. Most of us were armed with waterproofs, which turned out not to be necessary as we saw only a sprinkle of rain a couple of times during the morning and the afternoon was warm and quite sunny. 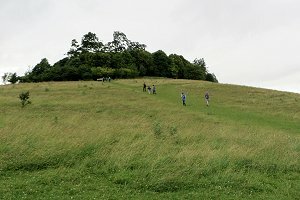 The name Wittenham Clumps refers to the clumps of trees at the tops of the two Sinodun Hills. Castle Hill, the shorter of the two, was the site of an Iron Age hill fort. We made our way up this hill and walked round the perimeter of the hill fort earthworks before crossing over to Round Hill and heading up to the clump of trees at the top. Here we had a good view of Dorchester-on-Thames. Following the Thames Path near Dorchester-on-Thames. Walking down the steep slope to the north of Round Hill, we approached the village of Little Wittenham and its bridge over the River Thames. (This bridge is used for the World Poohsticks Championship.) Crossing the Thames and some fields, we arrived at the Roman town of Dorchester-on-Thames where we stopped at the Abbey Tea Rooms. They were closed but we were able to use their facilities. After walking through the gardens of the Abbey Church, we made our way out of Dorchester, heading south to the Thames Path. 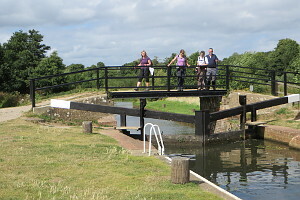 This we followed, back past Little Wittenham Bridge, and crossing the river at Day's Lock to continue on the other side. 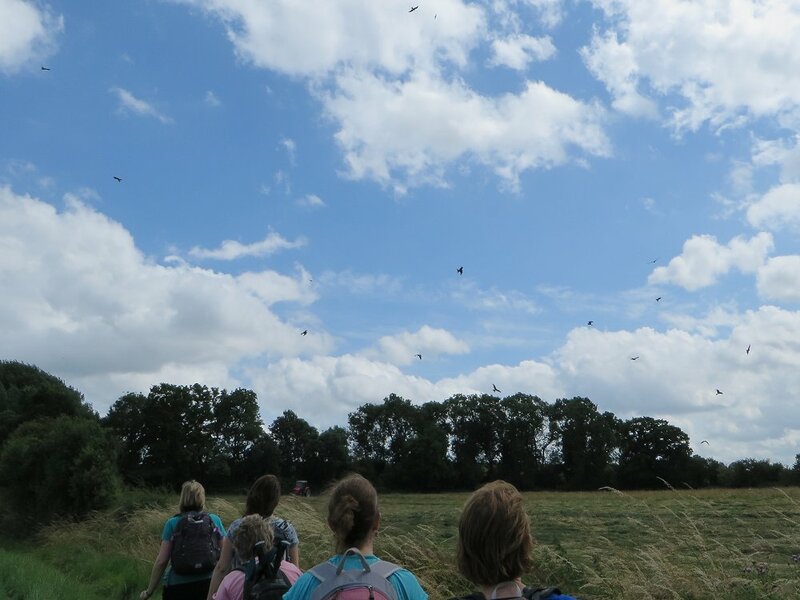 A large number of Red Kites circling over a field. We stopped for our picnic lunch on the Thames Path before leaving it and crossing farmland to reach the village of Long Wittenham. Here we stopped at the Plough Inn for refreshments. The weather made a short attempt at rain but sunshine soon followed. We made our way back by crossing mostly open farmland, during which we could see views of the partly demolished Didcot Power Station. At one point we passed a field where the farmer was using a tractor to cut the hay. Above the field a large number of Red Kites were circling. They were flying quite low and their beautiful markings were easily seen. A small amount of road walking brought us back to the car park. See our route on Bing Maps. On Wednesday evening 13th April, ten of us (including two newcomers and a member of the BWs) joined Sue for a short evening walk. We started from the green between the Queen's Oak pub and St James' Church, Finchampstead, and made our way past the Manor House and across Rectory Farm. The path led us through fields and woodland, past Banister's Farm, and onto the B3348 Fleet Hill. After a very short bit of road walking we turned off into Fleet Lane, which became just a track after passing Fleet Hill Farm. 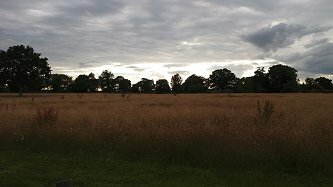 View of the sunset from Fleet Copse. This track is also the Blackwater Valley Path, which we followed only for a short while as it passed Fleet Copse. Then we left it for a footpath leading north toward Finchampstead village. Skirting the village and crossing the B3348 again, we headed back toward Rectory Farm. From there we took a footpath up to St James' Church and through the churchyard back to the green. See our route on Bing Maps. 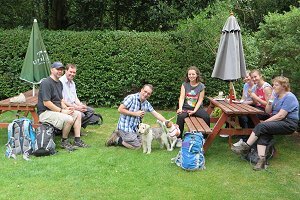 Most of us stopped for a post-walk drink at the Queen's Oak pub, where we sat in the beer garden until the rain started. 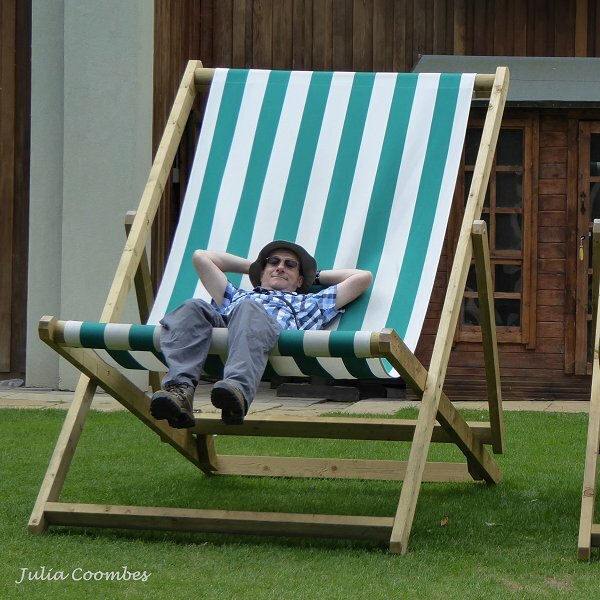 I stopped for a quick sit down on a convenient deckchair. Twelve of us gathered on Sunday 24th April in the recreation ground car park in Old Windsor for a repeat of the walk that Kathy and Ann had led for us last year. The twelve included regulars, some less frequent BWW members (it was good to see them again) and a few members of other local walking groups. 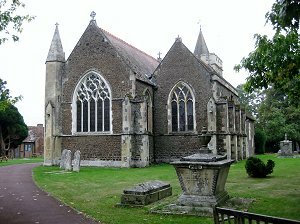 We set off along roads through Old Windsor until we got to the Church of St Peter and St Andrew, where we joined the Thames Path. Following the River Thames as it snakes past Old Windsor and The Bells of Ouzeley pub, we continued along the Thames Path past Runnymede and Magna Carta Island. 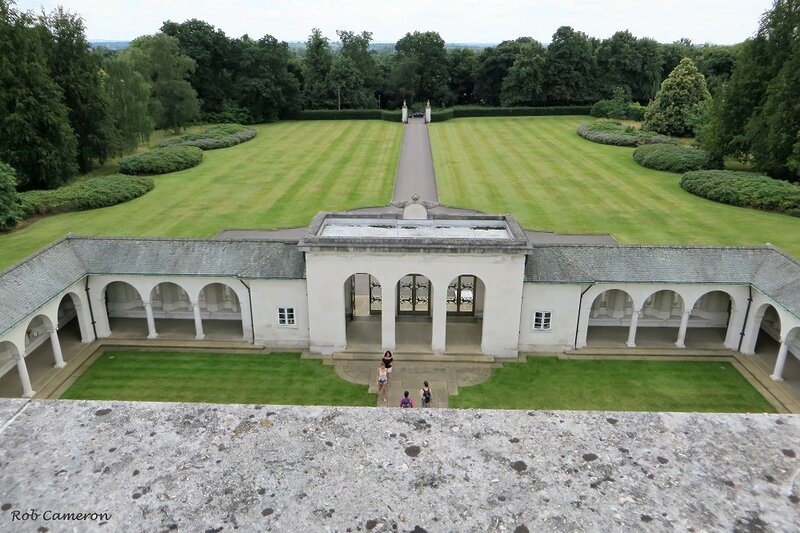 The portico of the Air Forces Memorial as viewed from the tower. Leaving the Thames Path we headed across a field and then made our way up the steep wooded path to Cooper's Hill and to the Air Forces Memorial. We stopped to have a look around this monument, erected in the 1950s in memory of over 20,000 men and women from the air forces of the British Empire who were lost during World War II. 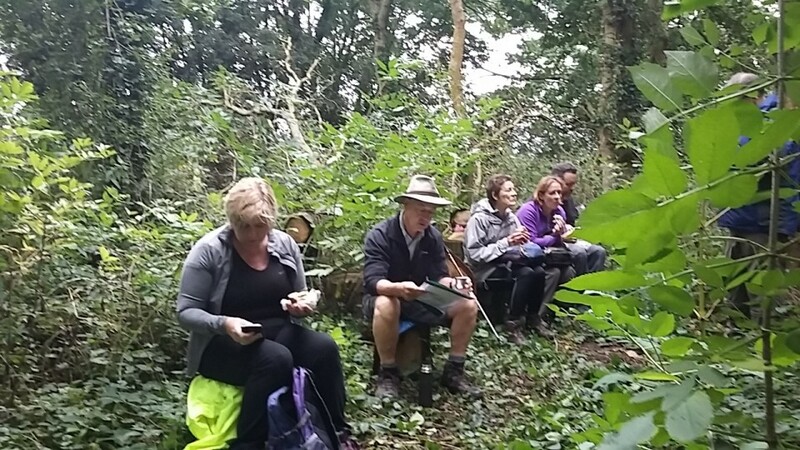 We ate our packed lunches in the grounds before heading off along the road to Englefield Green. A bit more road walking and we were out of the village and heading round to the other side of Copper's Hill. On the way back down to the river, we passed the John F Kennedy memorial, where we stopped to read the inscription. 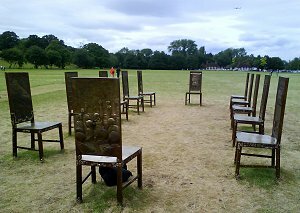 At the bottom of the hill we passed a permanent art installation consisting of twelve bronze chairs. The Jurors was created by artist Hew Locke in 2015 to commemorate the 800th anniversary of the Magna Carta. After inspecting this unusual exhibit, we move on to the nearby National Trust tea shop for refreshments. Re-joining the Thames Path we retraced our steps back to Old Windsor. We took a slightly different route through the houses back to the recreation ground. See our route on Bing Maps. This interesting walk with lots to see was well worth doing a second time. This time the rain held off throughout the whole walk. Last time we had a couple of downpours! 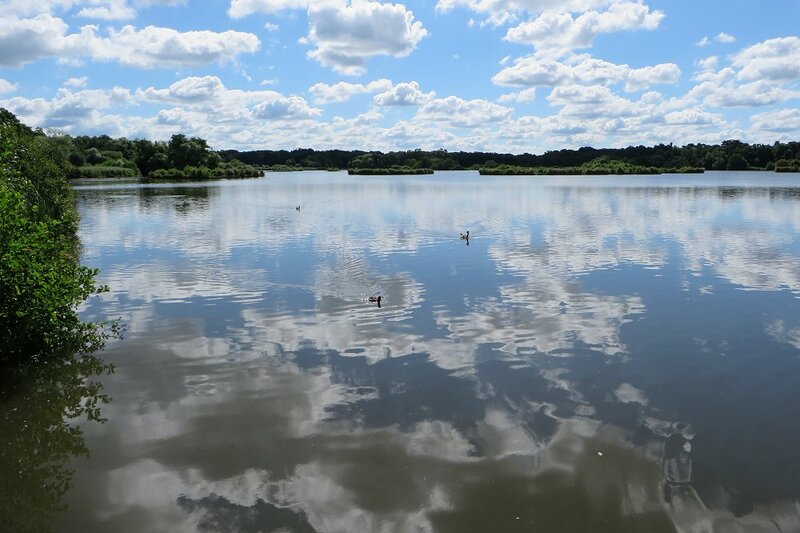 A view of Fleet Pond from the northern edge. We had nine people and two dogs on our walk on Sunday 31st July. This included three newcomers. Accessing the footpath via the car park, we followed this path as it squeezed between the northern edge of Fleet Pond and the railway station car park. Along the way were several jetties, some of them populated by anglers. 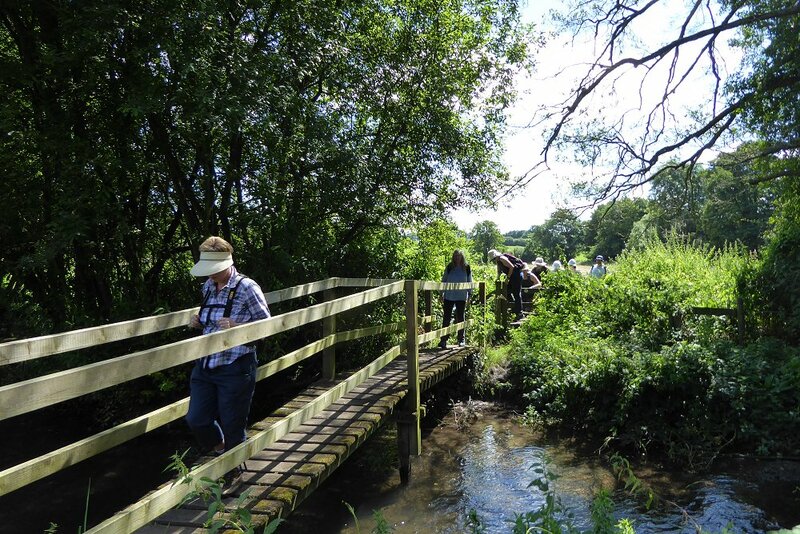 The path widened as the curve of the pond edge diverged from the railway and we entered the Fleet Pond nature reserve. 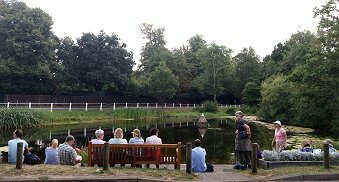 We stopped to get a good look at the pond while one of our members fed a few ducks with some pieces of bread. Passing through the nature reserve, we entered the MoD access land. Entering the Fleet Pond nature reserve. Our route ran parallel to the railway before turning south and then west through mixed scrubland. Next we headed south-west and then south-east through a forestry plantation until we reached Pyestock Hill, where we had to cross the main road at an odd shaped roundabout built over the Basingstoke Canal. 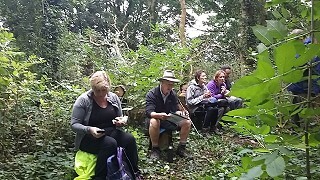 We continued our route through more forestry plantation until we reached an open clearing where we stopped for our picnic lunch. A fallen tree provided seating. 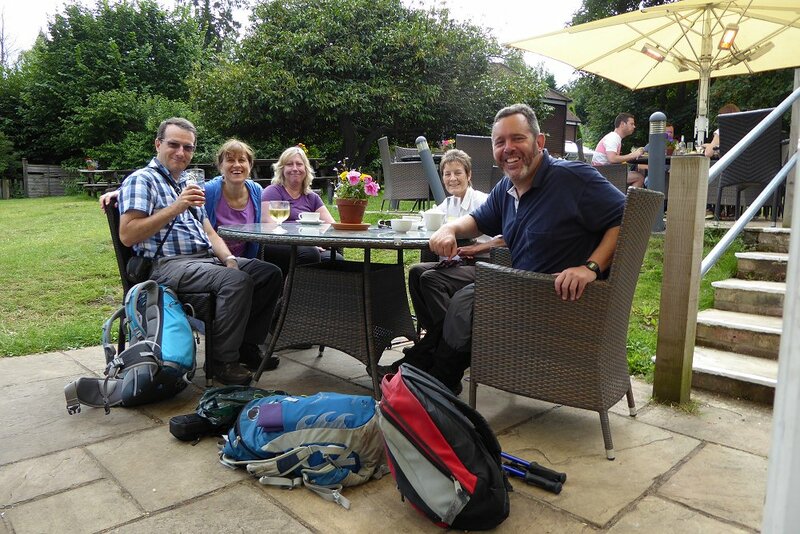 After lunch it was a short walk to The Foresters pub where we had a drink in their pub garden. The pub was quite dog-friendly, with water bowls outside and free dog treats available at the bar. Stopping for a drink at The Foresters pub. Suitably refreshed, we left the pub and followed a wide track through the forest, emerging by the Basingstoke Canal. We walked along the towpath for about half a mile, dodging the many cyclists, before leaving it for a path that followed a stream back to Fleet Pond. This path took us through forestry plantation and more natural woodlands on its way. We took a slight detour to what the locals jokingly call The Beach - a sandy strip at the edge of the pond. The dogs had a quick paddle but seemed unimpressed. We then followed a path that took us around the southern and eastern edges of the pond, back to the railway station. See our route on Bing Maps. 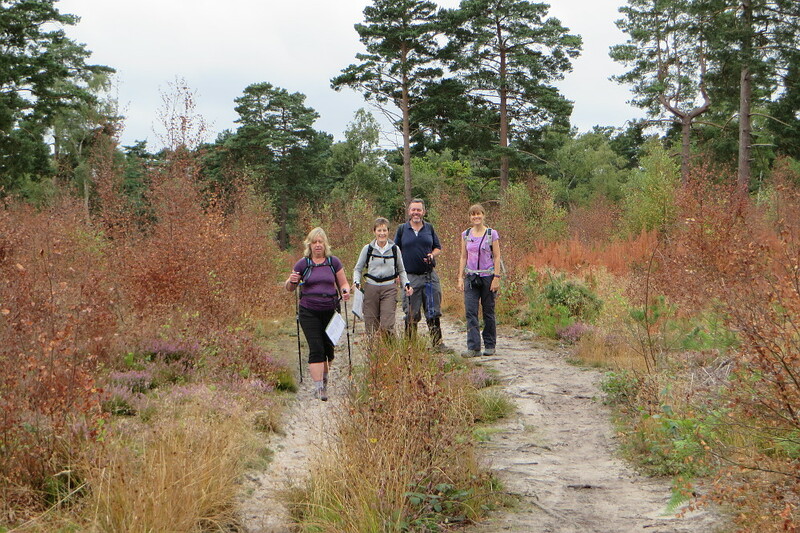 Walking through Bartley Heath, near Hook. 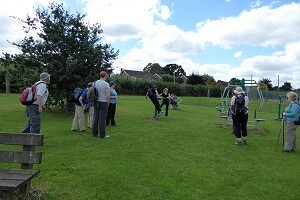 Eighteen people showed up for our walk on Saturday 6th August. This included five newcomers and a couple of visitors from other walking groups. The forecast was for a warm dry day and we got the weather we were promised with almost continuous sunshine and temperatures of 24°C. Leaving Hook railway station, we walked down to Bartley Heath, which we crossed to reach a track that would become Holt Lane as we followed it back into Hook. Crossing the A30 by The Crooked Billet pub, we followed another lane that became a footpath at Hook Mill. This footpath gradually drew parallel with the River Whitewater as it approached Borough Court. Crossing the River Whitewater near West Green and Mattingley. Crossing the Whitewater at a wooden bridge, we passed through a farm and then through a narrow woodland path, overgrown with brambles, finally emerging at West Green House. Glimpses of the National Trust gardens at West Green could be seen from the last section of this path. Here we joined the Brenda Parker Way, a 78-mile long-distance path connecting Aldershot and Andover, which we followed westward toward Rotherwick. We stopped for our picnic lunch by the River Whitewater near Mattingley before crossing the B3348 Reading Road at a rather hazardous bend in the road. Passing through a field of sheep, some woodland and a field of barley, we arrived in Rotherwick where we stopped off for a drink at the Coach and Horses pub. 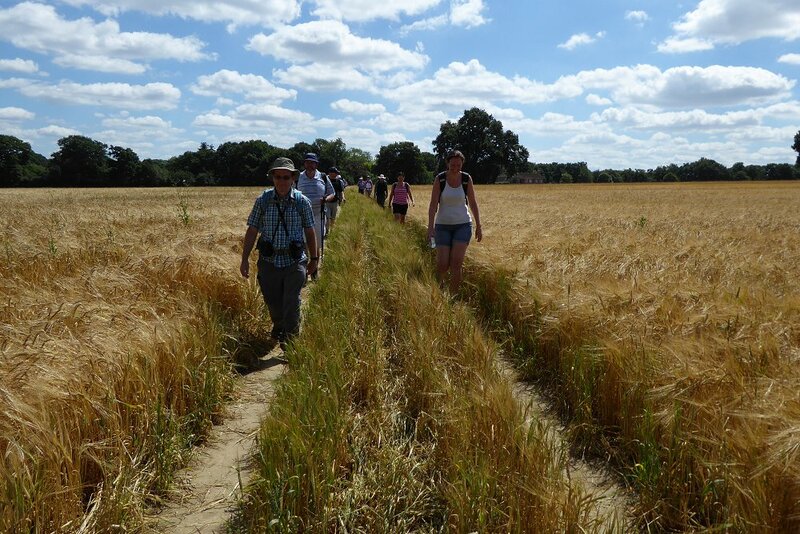 Walking through a barley field in Rotherwick. Departing from the pub and from the Brenda Parker Way we left Rotherwick and headed for the Tylney Park Golf Club. Carefully crossing the greens, we entered woodland behind Tylney Hall, a grand Victorian mansion and now a hotel. We emerged from the woodland onto a lane that led us to Newnham. Walking through this picturesque hamlet, we then took a footpath through a field of maize at Naishes Farm. The plants were about eight feet tall! We were soon back in Hook and joined the A30 by the War Memorial, which followed into the centre of the village. After passing various shops we were back at the station. See our route on Bing Maps. Thank you to Julia for providing the photographs. Walking past the mill pond at Friday Street. 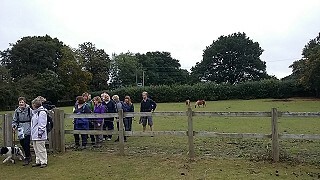 We had ten people for our walk on Sunday 14th August, which included a newcomer to the group. 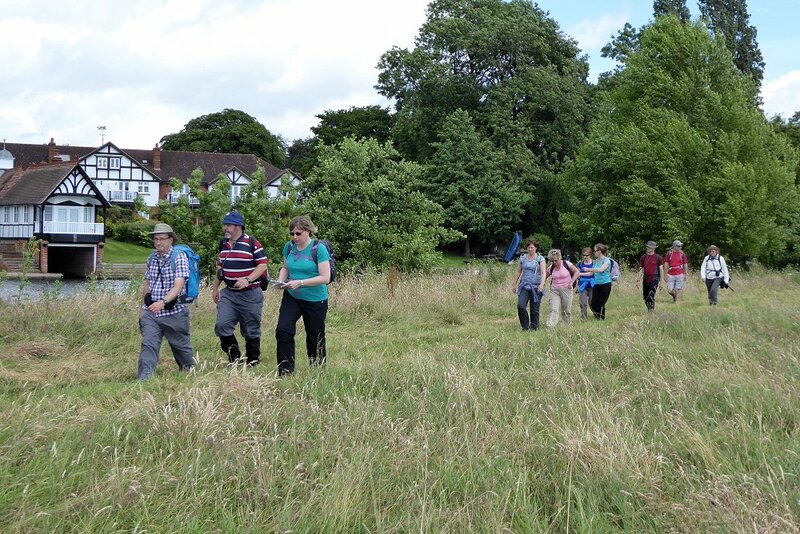 This walk was a little out of our normal area, being well into Surrey, but it gave us a chance to explore somewhere that was new to us although well known to our walk leader. Setting off from the car park we followed a path by the road that took us to the tiny hamlet of Friday Street, which is literally just one street. Walking past the mill pond and through Friday Street, the road soon became a track. This we followed for a short distance before turning off onto a footpath through the mixed woodland of Severells Copse. 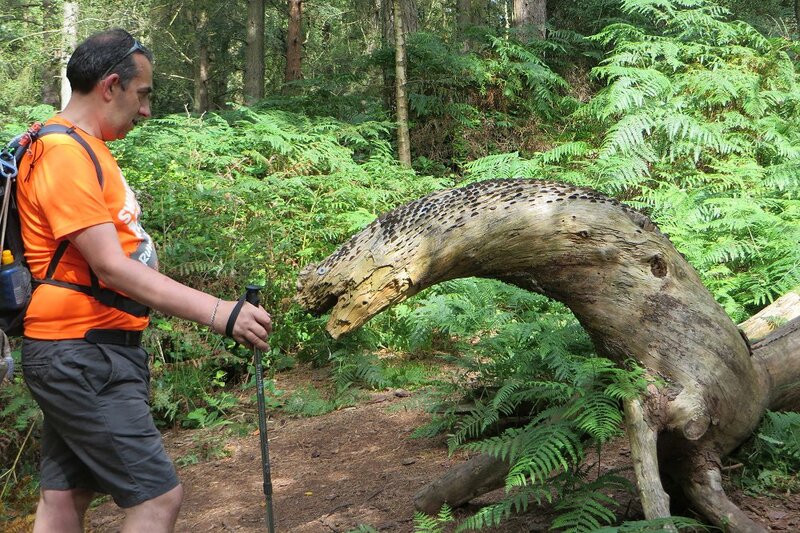 Investigating a weird wooden creature in Wotton Common. A bit of road walking then took us into Wotton Common, with its sandy soil and pine trees. 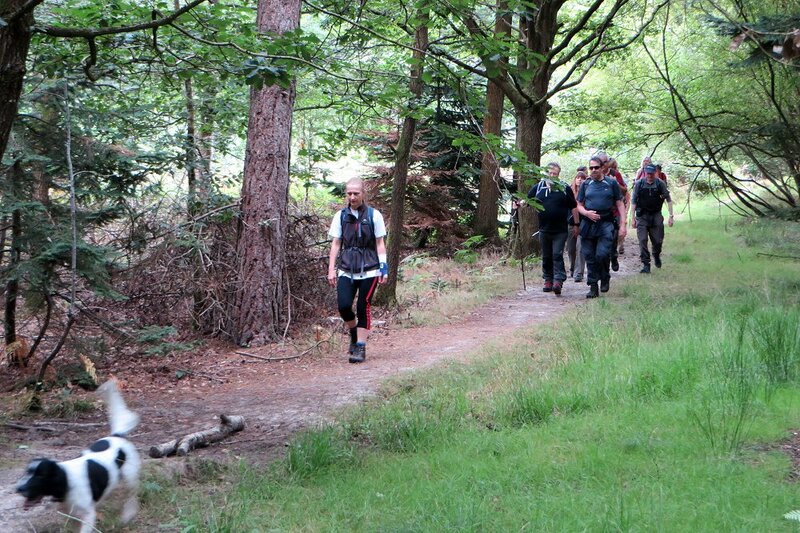 Following well established tracks through the woodland, we made our way upwards to Leith Hill. On the way we spotted a fallen tree of such a strange, snake-like shape that it had inspired someone to add eyes (two metal washers) and some scales (old copper coins driven into the grain of the wood). 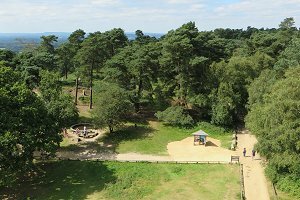 Leith Hill rises to 965 feet above sea level and at its summit is a tower, allowing you to reach an altitude of 1000 feet if you climb the long spiral staircase. 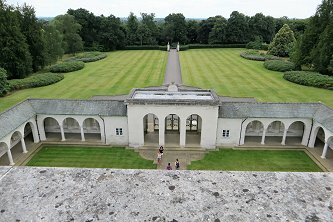 Some of us went up for the view - and what a view! View from the tower at Leith Hill. To the north-east you could see the silhouette of the London skyline. You could just make out the distinctive shapes of the 'Shard' and the BT Tower. 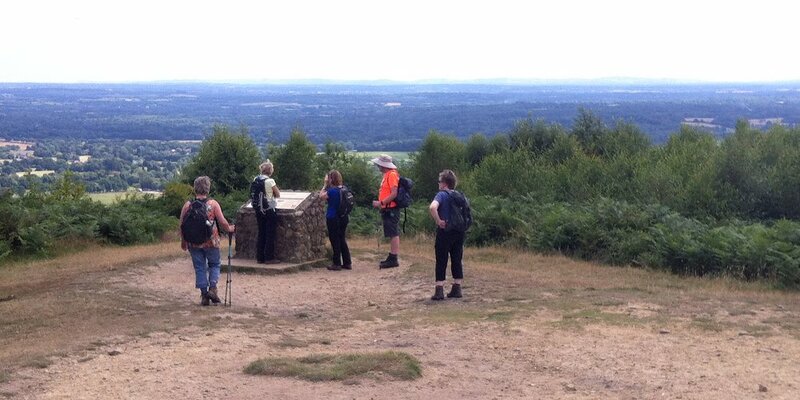 In all other directions you could see views of the Surrey Hills and North Downs. Leaving Leith Hill, we joined the Greensand Way, a long-distance path that follows the Greensand ridge along the Surrey Hills and Chart Hills to Kent. We followed it, and a footpath that ran parallel to it, for the two miles between Leith Hill in Wotton Common and Holmbury Hill in Hurt Wood. This hill is topped by the remains of an Iron Age hill fort, where we stopped to admire the view and have our picnic lunch. Admiring the view from Holmbury Hill. After lunch we walked through Hurt Wood and down into the pleasant village of Holmbury St Mary where we stopped at the Royal Oak pub for a drink. Suitably rehydrated on this warm day, we continued on the last leg of our journey, through the woodland of Holmbury St Mary and Abinger Common, back to the Friday Street car park. See our route on Bing Maps. This interesting and lovely walk was well worth travelling the extra distance to get to, with countryside quite different to our usual Berkshire scenery. A riot of colour in Blackheath. I have a confession to make. On Sunday 21st August, Julia and I drove to the wrong starting point for Ann and Kathy's walk. At first we wondered why no-one else had turned up, but a phone call to one of the leaders soon had us in the right place just in time for the start. I felt a bit guilty as I'm often telling people to check the directions before they set off so as not to keep everyone else waiting. Sorry! 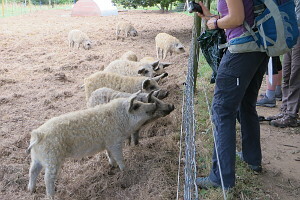 Woolly piglets at Lockner Farm. We set off, first heading up Rosemary Hill and then joining the Downs Link, a long-distance path that connects the North Downs Way with the South Downs Way. The sandy soil of Blackheath was supporting a wide variety of colourful plants including heather, fir trees and some rather Autumnal looking shrubs. Leaving the heath at Lockner Holt, we made our way through a small farm, which had a field of woolly piglets. Not something you see very often on our walks! The chuch at the top of St Martha's Hill. Then we took a detour from the Downs Link at Tilling Bourne, passing the picturesque Albury Mill and Postford Pond before heading up through the woodland of Colyers Hanger to join the North Downs Way. We followed this path up to the top of Saint Martha's Hill and stopped for a rest outside the church. We could hear that a service was taking place so we didn't go into the church for a look around. Descending the hill on the other side, we left the North Downs Way at the bottom and took an alternative route through the wooded and hilly Chantries. 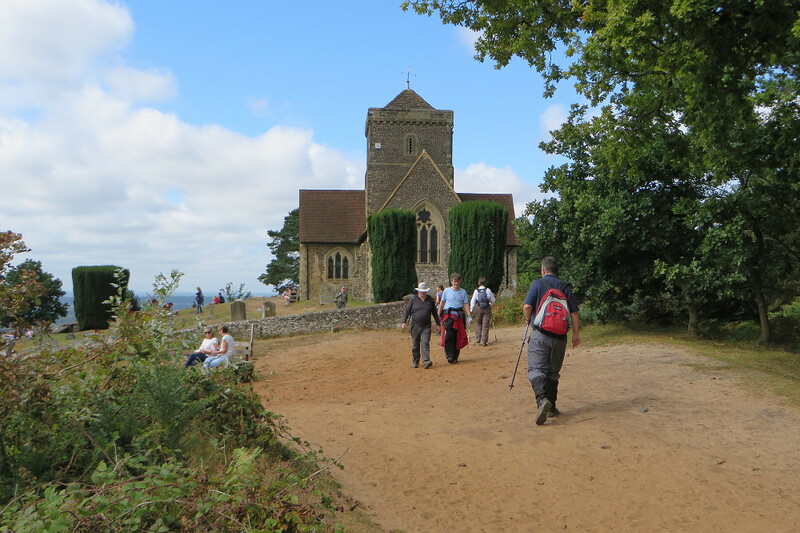 Stopping for lunch on an open high point, we sat on a bench that had a view across to Guildford Cathedral. Stopping for a drink at the Seahorse pub in Shalford. Making our way through the Chantries, we came to the village of Shalford. Here we passed Shalford Mill on the way to The Seahorse pub, where we stopped for a drink. 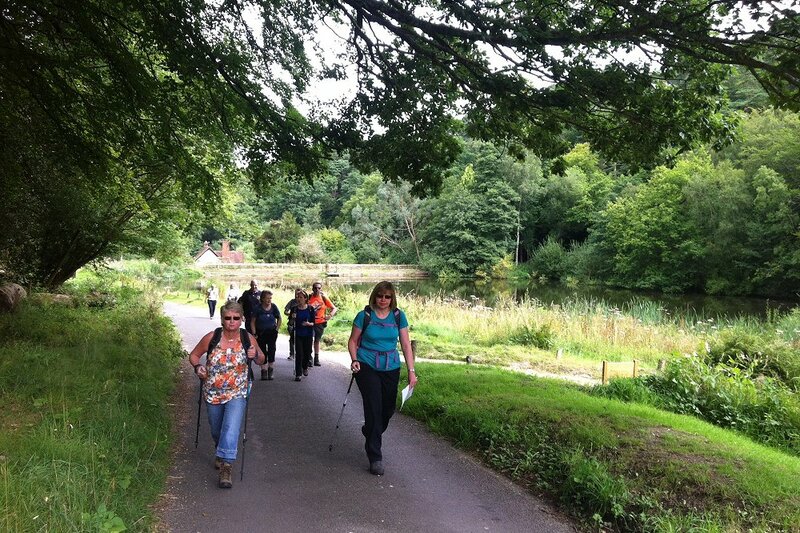 After our refreshment stop, we left Shalford on a footpath through a meadow and joined the River Wey. We followed the river northward until we reached a lock, where we crossed and began to follow the river southward, on the Wey-South Path. This we followed until we reached Broadford Bridge, where the Wey-South Path crosses the river and passes through Broadford. We carried on following the river Wey until it crossed under a dismantled railway, which we then began to follow. Crossing the River Wey at Shalford. We followed the Downs Link path through Wonersh Common and past Tangley Hill, back to Rosemary Hill. Finally, we retraced our steps down the hill and back into Blackheath. See our route on Bing Maps. It was certainly worth the trip out to Surrey for this interesting walk, which showed us many sights of a landscape different to our usual Berkshire. It also gave us a chance to pick many blackberries and gather a few fallen cooking apples. We're hoping Julia can turn them into a blackberry and apple crumble for us to have on another walk. 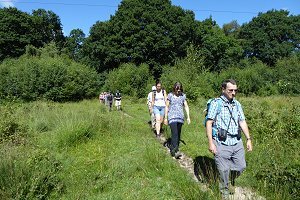 We had twenty people on our walk on the August Bank Holiday Monday. Many of these were members we haven't seen for a while, there were some visitors from other groups and a few newcomers. 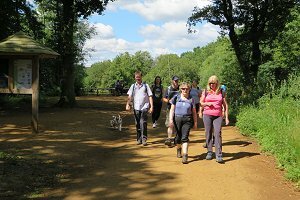 The sun was shining, despite being a Bank Holiday, as we started our walk from the car park by the Museum of Berkshire Aviation on the north-west border of Dinton Pastures country park. We followed the River Loddon past Whistley Park, heading north-east until we reached Whistley Bridge. Here we departed from the river and headed eastward to Broadwater, just south of Twyford, before following Hogmoor Lane to the village of Hurst. Crossing a field, we arrived at The Green Man pub. As it was just twelve o'clock, the pub had just opened but was still empty, so we stopped off for a quick drink before all the Sunday Lunch customers arrived. Stopping for our picnic lunch by the pond in Hurst. Sitting in the garden of this 17th century pub we enjoyed our drinks in the sunshine before crossing over the road to the pond, where we sat and had our packed lunches. After lunch we walked along quiet roads through Hurst and down to Lea Farm before crossing into Dinton Pastured country park. We walked along the edge of Hurst Golf Course before joining a footpath that followed around the edge of Black Swan Lake. By now there were plenty of families in the country park enjoying the fine weather. The path took us half-way around the lake before passing between Black Swan Lake and Sandford Lake. Now following the edge of Sandford Lake, we made our way back to the museum car park from where we'd started. See our route on Bing Maps. Walking through the woodland of Burgess Copse, near Bucklebury. 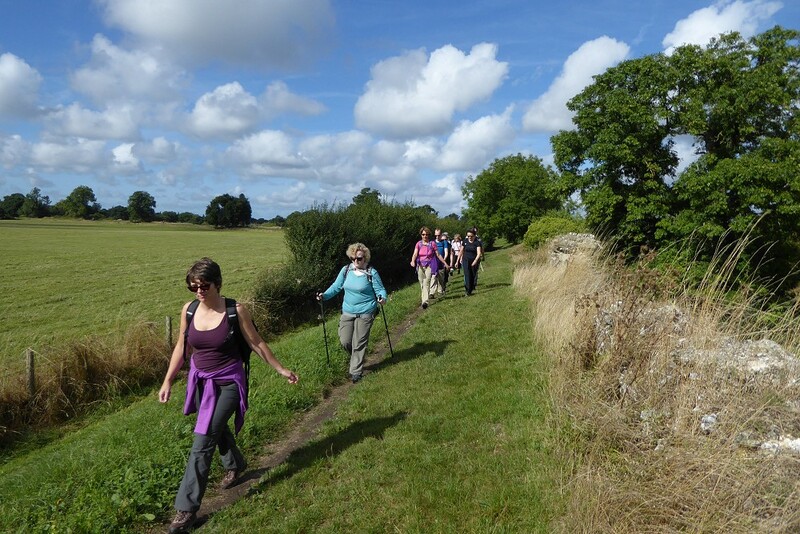 On Saturday 3rd September, Mike and Alison led a circular walk for us starting from Bucklebury. We had twelve people, eleven regulars and a newcomer, plus a dog called Wellington. The walk started off from the playing field car park and followed the footpath signs through the church yard, across a field and onto a quiet road. We crossed the River Pang on a small road bridge and continued north. We then headed uphill along a tree covered lane and into the woodland of Burgess Copse. Continuing northward through woodland paths, we emerged at the edge of a field opposite The Pot Kiln pub in Frilsham. It was only a quarter past eleven and they weren't open yet, so we walked up the little lane from the pub and took another footpath into a pine tree plantation. Walking through a recently harvested wheat field on Pangfield Farm. Our route took us east and then south, through woodland and fields down to Pangfield Farm. 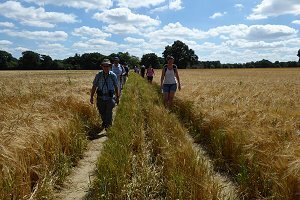 Here we left the main bridleway for a narrower footpath going east through recently harvested wheat fields and eventually bringing us to the village of Stanford Dingley. We stopped to eat our packed lunches on the little green outside the Bull Inn before going inside for a drink. Inside the pub we saw a number of very smartly dressed gentlemen, clearly on their way to a wedding. Us with the groom on the green outside the Bull Inn, Stanford Dingley. As we left the pub, the groom, best man and other young men in morning suits were having their pictures taken on the green. The photographer thought it might be entertaining to have us in a picture with the groom. We've never been asked to photo-bomb a wedding before! We wished him luck before continuing our walk. 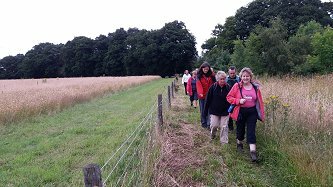 We took a footpath that crossed the River Pang on its way out of Stanford Dingley, heading west and then south, down to Chapel Row Common. From there we headed north, crossing the Pang once more before joining the road back into Bucklebury. It took me by surprise when we found ourselves back at the car park as the road looked quite different when coming the other way. See our route on Bing Maps. 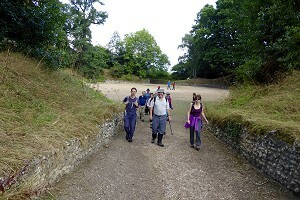 Following the north wall of Calleva Atrebatum. On a sunny September day twelve people, including four newcomers, gathered for this interesting circular walk from the Roman Town of Calleva Atrebatvm. Following the Silchester Trail we walked along the impressive ruins of the Roman Wall before stopping off to explore the remains of the Roman amphitheatre. Continuing on, we passed the ancient church of St Mary the Virgin, which unfortunately we were unable to look inside, as there was a service in progress. Exploring the Roman amphitheatre near Calleva Atrebatun. A slight unintentional detour down Church Street gave us some impressive views of the Roman walls before we retraced our steps to find the right path. This took us through some stubbly fields and eventually across a footbridge by Clappers Farm. Walking past Brickledons Farm and across more stubble we passed some fields of maize before reaching the outskirts of Bramley. Arriving at the village we were greeted by the enticing smell of baking which seemed to be coming from the Bramley Village Bakery near the station. Trying the out-door gymnasium at Bramley sports ground. Soon after, we reached our lunch stop on the green by the cricket club and tennis courts where some of us enjoyed trying out the outdoor exercise machines before we resumed our walk. 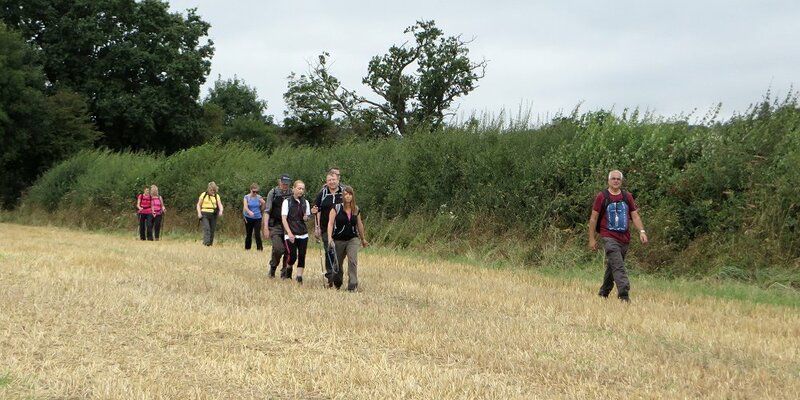 Making our way back towards Silchester, we followed the edges of Bramley Frith Wood through yet more stubbly fields, eventually going through a copse and fields where on this occasion there was no sign of any cows. 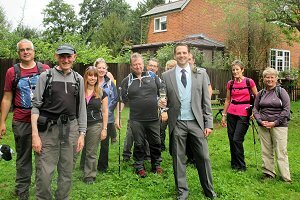 We then headed along to Silchester Village where the Calleva Arms provided us with some welcome refreshment and social chat before returning back to the site of Calleva Atrebatvm and the car park where we had begun. See our route on Bing Maps. Special thanks to Julia for leading this walk in my place, taking the photos and writing it up. On Saturday 17th September we gathered at Frost Folly car park in Wellers Lane, which was surprising full due to another walking group heading out 30 minutes before us. Apparently this country car park was opened in 2003 by Jean Frost, her late husband Chris Frost having donated the land to Warfield Parish Council for use as a countryside amenity. We had a little rainfall while at the car park, and although a lot cooler than previous days the rest of the walk remained free from any further showers. 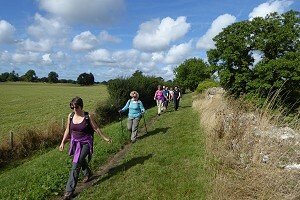 We were very pleased to welcome four new walkers who joined our group today. Fifteen of us (plus a very energetic dog) set off on a country path from the far left hand corner of the car park, alongside farmland, over the stream and up the steady incline. At a beautiful old oak tree we turned left through a kissing gate onto St Katherine's Drive, heading towards St Michael's church. Past the vicarage we took a gate into a paddock where some cute Shetland ponies were grazing, not at all fazed by our accompanying dog. Passing through a field of ponies near Warfield. Leaving the ponies behind we walked through two fields and across the bridge over the stream onto a path, which luckily had been recently been cut back. So, minus the overgrown stinging nettles, we headed over the wooden boardwalk (recently installed, so the usual very wet and muddy area did not have to be braved) towards the road at Wane bridge. With Hayley Green Farm away to the right, (which is apparently the oldest dwelling in Warfield) we followed the path across the field, passing the stables on the right and emerging at Brockhill. Passing by Planners farm and through several fields, we reached the A330 where we stopped for a short 'banana break' before following Garsten Lane and then Hog Oak Lane. Stopping off for our picnic lunch. After a leisurely lunch we picked up the track along Hawthorne Lane until we reached Buckle Lane and then headed straight to the main road and the Shepard's House pub. Although we have stopped at the pub on previous walks, after an unanimous decision (due to the coffee machine being out of order) we crossed the road and headed up Bowyers Lane to the Frost Folly car park where we started the walk. Thank you to Ann and Kathy for leading the walk and to Ann for writing it up.